So you think you want a rabbit? Our pet rabbits are wild rabbits at heart. All rabbits are prey animals and in the wild they rely on the company of other warren members, not only to keep warm in the winter but also to warn them if predators are around. So a single rabbit will feel anxious. It will need to be on the alert for danger 24/7 and never completely relax because there is no other rabbit to let it know when a predator is near. Rabbits only really speak rabbit. They don’t speak English, they don’t speak guinea pig, they don’t speak cat. But they speak rabbit really very well. They can communicate with each other and all those subtle little body language signs that we miss, they understand. 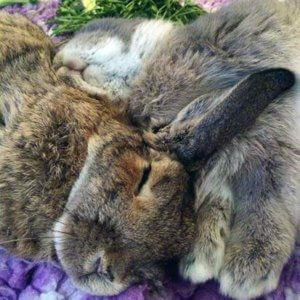 Studies have shown that rabbits value the company of other rabbits as much as they value food. We wouldn’t dream of keeping food from them would we? So why starve them emotionally by keeping them alone? Sometimes people put a rabbit and a guinea pig together to be friends and although it very occasionally does work, we recommend strongly against it. If your rabbit and guinea pig are already bonded, please don’t separate them, that would be cruel, but rabbits (and guinea pigs) need a companion from their own species. They will act the same way about grooming and snuggling, will have the same diet and exercise needs and they are less likely to be carrying an infection that could kill their companion. To be kept in (at least) pairs, rabbits must be neutered – castrated or speyed (recommend regardless). If they weren’t already in a bonded pair (or group) when they came to you, you can’t just put them together and expect them to like each other. Pairing up is sometimes a long process but very well worth the patience and persistence.